Today, we were amazed to meet the men who create the special shoes that are worn by children with clubfeet. Part of the Ponseti method is, after casting and a tenotomy (where the Achilles tendon is sliced through so the foot becomes flexible. Then the leg is cast and the tendon grows back) the children wear special shoes with a bar between them for 23 hours for the first 3 months, then for 5 years at night only. This process allows the children’s feet to typically be 100% corrected by the time they start kindergarten. These men create the entire shoe, from tracing the leather, cutting the forms out, attaching the leather “upper” to the wooden base and then lining it with leather. After this is done, they pass it over to the man who drills holes through the leather for the laces and then the shoes are attached to the bar. 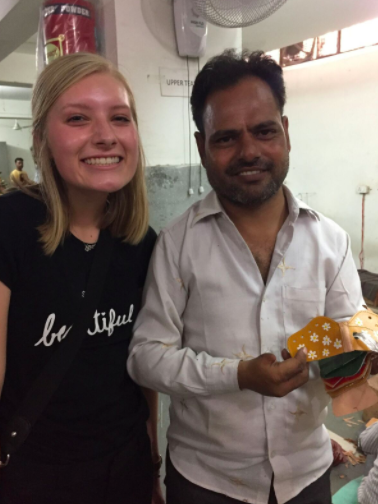 The entire process is done in a small space in Delhi where thousands of shoes are made each month. These men are responsible for the perfect feet of thousands of children. These men are some of the heroes of CURE, whose mission it is to heal the sick and proclaim the mission of God. These men should be celebrated! Us and the cool men working so hard to change lives ! !